Hulu has announced Fall 2016 premiere dates for a returning comedy, a new special and three all-new dramas. First up is the special The Beatles: Eight Days a Week - The Touring Years. That premieres Saturday, September 17 and is directed and produced by Ron Howard. Based on the first part of The Beatles' career (1962-1966), Ron Howard's film will explore how John Lennon, Paul McCartney, George Harrison and Ringo Starr came together to become this extraordinary phenomenon, "The Beatles." Then it is season five of The Mindy Project, streaming weekly beginning Tuesday, October 4 for 16 episodes and starring Mindy Kaling, Ed Weeks, Ike Barinholtz, Beth Grant, Xosha Roquemore and Fortune Feimster. The comedy of course is a single-camera comedy series created by and starring Emmy(R)-nominated writer/producer and New York Times best-selling author Mindy Kaling, which follows a skilled OB/GYN navigated the tricky waters of both her personal and professional life. And the final drama is Shut Eye, which was slated for August 31 but will now premiere on Wednesday, December 7 for 10 episodes. Jeffrey Donovan, KaDee Strickland, Isabella Rossellini, Emmanuelle Chriqui, Susan Misner, Angus Sampson and David Zayas star. Charlie Haverford (Donovan) is a scammer with a small chain of fortune-telling storefronts and contracts building tricks for a family that controls the business in the greater chunk of Los Angeles. A blow to the head from a client's angry boyfriend intersects with a hypnosis session while auditioning a new "clairvoyant," and suddenly, a man whose entire life has been based on fraud begins to see and feel some very real and fundamental truths. Charlie's wife Linda (Strickland) is sick and tired of their mediocre life and wants to break away from Fonso (Sampson), the single father who runs the Marks family's psychic empire and controls the Haverford's future. Rossellini co-stars as Rita, the cunning, seductive and sadistic matriarch of the Marks clan. 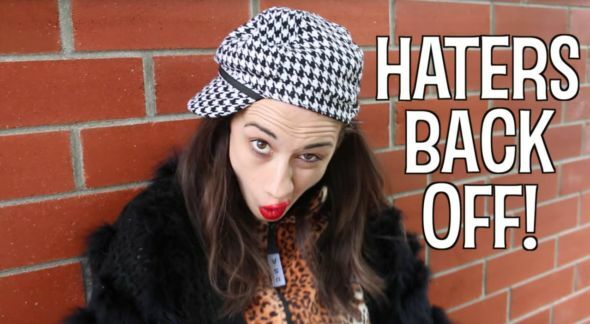 Netflix has announced a series premiere date for Haters Back Off. All eight (8) episodes of Haters Back Off will premiere globally on Friday, October 14, 2016 at 12:01am PST exclusively on Netflix. Based on the character created by Colleen Ballinger, Haters Back Off delves into the oddball family life of Miranda Sings, an incredibly confident, totally untalented star on the rise who continues to fail upward by the power of her belief that she was born famous, it's just no one knows it yet. The series stars Colleen Ballinger as Miranda Sings, Steve Little (Eastbound & Down) as Miranda's overly confident and utterly misguided Uncle Jim, Angela Kinsey (The Office) as Miranda's mom, Bethany, and Erik Stocklin, Miranda's neighbor and best friend, Patrick.